During Soviet rule, care for the disabled was appalling. Rehabilitation was non-existent, with babies being tied to their cots in warehouse-like conditions until they died often from infected bedsores, with an average life expectancy of two years. The Lady Cox Rehabilitation Centre is a ‘Centre of Excellence’ that provides physiotherapy care for the whole of Artsakh (another name for Nagorno-Karabakh). Physiotherapy is still not recognised as a critical treatment for stroke, cerebral palsy and spinal cord injury patients. The centre has to run only on minimal funds from the state and charitable donations but provides care for a wide range of patients from the city centre to the most remote villages. The centre also provides rehabilitation for autistic and cerebral palsy children, with state-of-the-art facilities staffed with psychologists, speech therapists and other professionals, at a ratio of two children per every professional. The autism centre works by placing the children in everyday situations and teaching them how to handle themselves safely. I was lucky enough to visit HART’s partner in Stepanakert and stay in the centre for two weeks. I experienced the life-changing work they do first hand. The centre offers a huge range of first class treatments to aid the physical health of its patients. However, it also provides pastoral support in the form of leisure facilities like table-tennis sessions, table-football games and arts and crafts. I found the idea of arts and crafts classes particularly inspiring, as not only is it fun for the patients but activities such as macramé and pottery making also help to strengthen muscles and improve manual dexterity, a vital part of treatment for stroke patients in particular. I also had the opportunity to visit the beautiful Lake Sevan which is located in Armenia and constitutes one of the largest bodies of freshwater at such a high altitude. The centre often takes their patients here for holiday breaks to the Armenian Camp. Taking the patients to this magical place is a wonderful idea, allowing them to swim and enjoy water-sports, in a beautiful environment. Again, although this is anyone’s idea of a fun day out, it also doubles as excellent physiotherapy treatment. Swimming in the lake provides excellent hydrotherapy treatment, whilst using apparatus such as paddleboards can help strengthen muscles and improve balance. One of the most important aspects of the Centre is their efforts to encourage integration for those with disabilities. The day-care nursery offers ten places for children with a range of disabilities and ten places for children without. As a result, these children can learn and play alongside each other, become friends and diminish any likelihood those children have of developing prejudices. The nursery is a happy, fun place which is always filled with singing and laughter, where the kids can use the facilities of the centre, including the hydrotherapy pool! I have never truly appreciated the importance of physical therapy in the treatment of certain conditions such as stroke. In England, physiotherapy is a service we take for granted, with every hospital having a fleet of experts on hand to help the healing process. Mobility is another thing which we take for granted. Losing one’s mobility can be devastating, severely restricting one’s capabilities and quality of life. If we can help to limit this after conditions such as stroke, it should be a priority. The Lady Cox Rehabilitation Centre is the only centre of its kind in the entire Artsakh region; they, therefore, provide an essential service which greatly improves the quality of life of many people. This was made all too clear to me when I went to visit. Wherever I went with Vardan – the founder of the centre – people knew him and would approach us with smiles and thank Vardan for the amazing work he had done for their mother/brother/neighbour or any other relation. The Lady Cox Rehabilitation Centre is run by inspiring, friendly people who are experts in their field. I loved spending time there as it showed me what a worthwhile cause it is. All the centre needs now is to improve its reach and expand its capabilities so that even more people can benefit from the amazing work of the staff who work there. 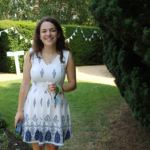 Hi, I'm Jodie Russell and I'm just starting my third year studying medicine at Newnham College, Cambridge. I have a keen interest in global health equality and public health care. I have previously worked with disabled people in my hometown, for a charity called Winchester GoLD helping run low-level workout sessions for people with a range of illnesses.